Our heat wave has ended and cool, crisp, typical fall days are embracing us. This month I've been picking apples in Paradise. 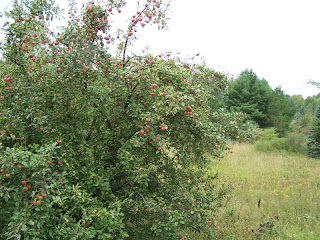 Along the side of a country road in Paradise Township, I've discovered apple trees, long gone wild and neglected. The apples are a little puny this year. We just didn't have enough rain. But that does not diminish my delight. As a child I used to sneak into active orchards and steal one or two apples for a snack. Stolen fruit tasted so much more delicious. Now, there are so many abandoned trees that I can pick a couple of bushels in broad daylight without repercussion. Of course, in my childhood imaginings, the orchard owner was far more dangerous and evil than any farmer can possibly be. But the adrenaline produced by thoughts of an angry farmer made the fruit just a little sweeter. Sadly, the orchards are being abandoned as fruit farming takes a back seat to more profitable endeavors with the land. 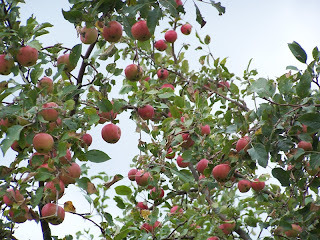 During my late teens and early 20's, I picked apples each fall for extra cash. I worked hard, climbing up tall, skinny, and precariously placed ladders to fill a metal and canvas bucket hanging from shoulder straps in front of me. Then, descending that ladder with my burden, I would open the bottom of the bucket and empty the apples into a large crate. I got paid by the crate but now I can't remember how much. It seemed like very good money at the time. I suppose because that hard work didn't feel like work at all. I mean, what's not to love? I was outdoors during the most beautiful time of year, I had plenty of apples to eat and take home, I was moving my body and I was making money. I once lived in an old farmhouse with a cider press in the backyard. We made fresh cider every October. Once the excess juice and pulp hit the ground, the deer visited my back yard every night throughout the fall. I so enjoyed sitting on the back porch, a hot, spiced cider in hand, watching the wildlife descend upon the remains of my labors. ...staying home, evening fires, Indian Summer, bushels of tomatoes, pickling and canning, a new box of crayons, a new teacher, new school clothes, color tours, falling leaves, piles of leaves, burning leaves, acorns falling on your head, hot drinks, the buzz of a chain saw, the rhythmic thud of an ax, camo clothing, bows and arrows, tree stands, muskie fishing, football, warm socks, wool blankets, fuzzy sweaters, cider, fried doughnuts, apple pie, acorn squash, mums, pumpkins, cold mornings, warm afternoons, seeing your breath, morning frost, vees of honking geese, large flocks of birds, ...what else? Have I missed anything? Please share. And enjoy the sights, sounds and smells of your own little Autumnal Paradise. Labor Day marked the beginning of the end of tourist season here in Northern Michigan. The crowds have diminished. Our fair-weather friends have gone home. 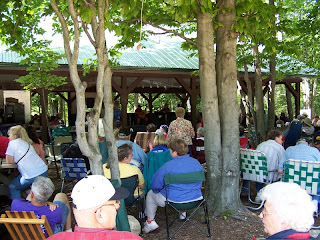 For those of us who live here all year, it is the time to lean back in our chairs a little, throw another log on the fire, take a deep breath and a sigh of relief, and once again enjoy the company of those friends and neighbors we lost to the summer frenzy of living in a resort community.